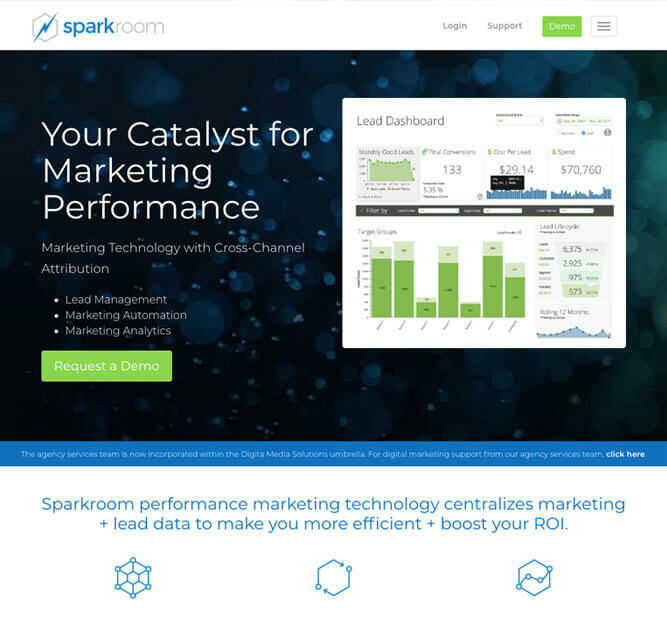 Sparkroom, the proprietary performance marketing technology of our parent company, centralizes marketing and lead data to make marketers more efficient and boost ROI. Sparkroom is an ideal marketing technology solution for the consumer finance industry, including mortgage marketers and personal loan lenders. Ideal for long-lead lifecycle marketers focused on driving results through online channels, including mortgage marketers and personal loan lenders, Sparkroom performance marketing technology integrates data from disparate marketing system to provide a holistic view of marketing performance. Lead Management: Centralized pay-per-lead (PPL) media planning and vendor management, including FPIs, forms, vendor invoicing, call tracking and more. Leads that come through the system face real-time validation, verification, de-duping, data matching, rejection and scoring (if desired) via proprietary solutions and third-party plug-ins. Marketing Automation: Following custom rules based on any set of data points, Sparkroom users benefit from process-based automation and lead routing. Sparkroom also acts as a hub for the centralized triggering of marketing automation and nurturing campaigns, prompting time- and milestone-activated messaging events. Marketing Analytics: Sparkroom gathers, translates and reformats data produced from multiple sources to provide holistic views of marketing campaigns. Connecting the dots from pre-lead to post-conversion data, Sparkroom lets marketers easily draw insights and optimize campaign performance. Custom Builds: The Sparkroom support team works with clients to understand current successes and challenges. Implementations are customized to maximize ease of use, simplify campaign management and optimize campaign performance.